I don’t know about you, but the thought of spilling nail polish on my carpet is enough to keep me up at night, or at the very least to always leave my manicure to the professionals. But a new year brought a new family budget and I decided to keep my manicures in house for a while. 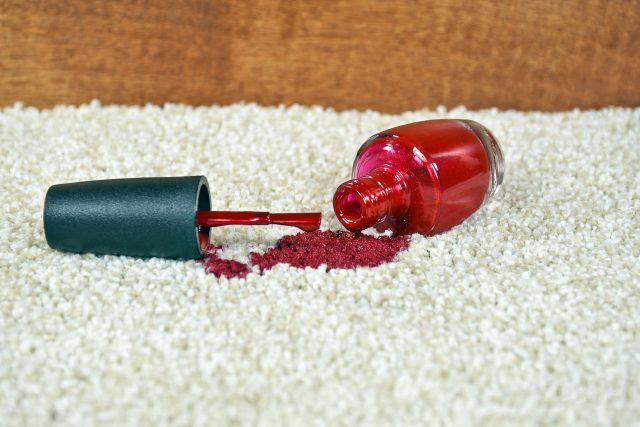 I did a lot of research on the best way to get nail polish out of carpet — just in case a dreaded spill did happen. And of course, it did. Want to know the best way to get nail polish out of carpet? 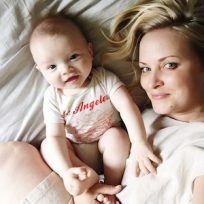 Here is what I learned — unfortunately, from experience. I saw a lot of “tutorials” telling you to treat the stain immediately before it dries. But I found that only ended up spreading the stain around and that letting the polish dry first worked better. Don’t use nail polish remover on dark carpet. First, let the stain dry. Using a palette knife or similar tool, try to chip off as much of the dried polish as possible. Wet the stain with cold water. If your carpet is dark, spray hairspray on the stain. Next (still for dark carpet) dab a small amount of rubbing alcohol onto a white cloth or rag and blot the stain. Repeat until it is gone. Remember: blot, don’t rub! If you have light coloured carpet, put an acetone or non-acetone nail polish remover on a white rag or cloth (after wetting stain with cold water) and then blot. Repeat until stain is gone. I hope that works for you if you find yourself dealing with a nail polish stain on your carpet. And next time, maybe keep it in the bathroom.